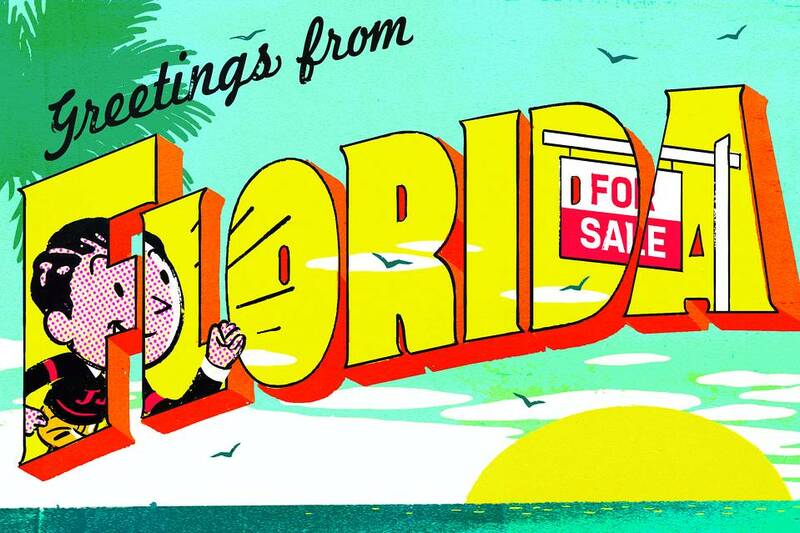 Home sales in the Sunshine State were up 19.6% in June compared with a year ago. In terms of real estate, the winter of 2014-15 may be the best thing that ever happened…to Florida. The Sunshine State is No. 2, behind California, in jumbo volume for both primary and secondary homes at Quicken Loans, says Bill Banfield, vice president at Quicken, one of the country’s largest jumbo lenders. “When you have got people who get cold in the wintertime, they start thinking about places they would rather be. And that places Florida at the top of the list,” he says. In June, sales of single-family homes were up 19.6% and condo sales 14.6% in Florida compared with a year ago, according to Florida Realtors, the state’s largest trade association for residential real-estate professionals. The median home-sale price for single-family homes in Florida is $203,500, well under the $417,000 limit for government-backed loans in all but two counties in the state. Driving jumbo lending are markets like Miami Beach, where conforming loans are capped at $417,000 but the median sale price of a bayfront home is $2.7 million and waterfront estates can reach $40 million. Other Florida metro areas with high jumbo volume include Miami-Fort Lauderdale-Pompano Beach area (median sales price $295,000), North Port-Bradenton-Sarasota ($245,000), Cape Coral-Fort Myers ($212,250) and Jacksonville ($212,000), says Andre Brooks, Florida regional sales manager for Wells Fargo Home Mortgage, which holds the largest volume of jumbo mortgages in the U.S. Lenders say that many borrowers in Florida are retirees moving south or out-of-state residents buying vacation homes. But another big demographic is self-employed entrepreneurs, says Tom Wind, executive vice president of home lending at Jacksonville, Fla.-based EverBank. Small-business owners like the fact that Florida has no state income tax and a business-friendly environment, he adds. EverBank also does most of its Florida jumbo lending in the south and southwest coastal regions, with the majority of loans in the $800,000 to $1 million range, Mr. Wind says. “We see a lot of people coming from the Northeast to the east side of Florida, and from the Midwest to the West Coast,” he says. Foreign buyers, mostly from France and South America, are also big in the Miami area, where more than half of sales this summer have been cash transactions, says Ines Hegedus-Garcia, an agent with Miami-based RelatedISG International Realty. In hot areas like Miami Beach, home buyers should be prepared for bidding wars and final sale prices above listing prices, she adds. In competitive markets, borrowers are sometimes losing out to cash buyers even when they bid higher. Higher down payments. While jumbo mortgages typically require a 20% down payment, some Miami sellers will also make that mandatory even when the buyer’s lender has looser requirements, Ms. Hegedus-Garcia says. “The seller wants to see a stronger buyer,” she adds. Many Florida borrowers put down even more, 30% or 40%, on homes in the $1 million range, Mr. Banfield says. Cash now, finance later. One way that jumbo borrowers compete with cash buyers is to purchase with cash and then refinance a few months later, Mr. Brooks says. Roughly half of Quicken’s Florida jumbos are refinances, Mr. Banfield says. Consider an ARM. About 40% of Wells Fargo’s jumbo mortgages in Florida are adjustable-rate mortgages (ARMs) compared with only 10% of the general mortgage population, Mr. Brooks says. Quicken also sees a lot of ARM borrowers who aren’t quite at retirement but want to buy a second home. They get a jumbo with low rates for the initial five years, for example, then use the proceeds from the eventual sale of their primary home to pay off the ARM before higher rates kick in, Mr. Banfield says.